I swear, there is a conspiracy to increase tourism in Ireland through their cultural exports. Every movie I have seen in Ireland has made me realize I need to visit this place as soon as possible. Dublin is the main setting for this great movie about a man, Fred Daly (Meany), coming back from England, and without any prospects, he is forced to live out of his car in a sea-side car park. When a similarly homeless 21-year old pothead Cathal (Morgan) decides to park next to him in the same car park, the two strangers become reluctant but ultimately the best of friends. 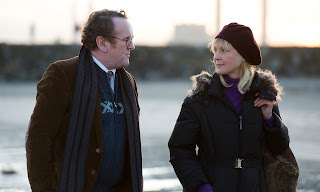 It seems that Ireland is the place to develop friendships that make you take charge of your life, as this is what happens through the course of this movie with Fred and Cathal. I'm also thinking of how similar this movie is to ONCE in that most basic aspect. There are no catchy songs, but the relationship is still there. There is a heaviness in the way that Meany plays Fred; he is perpetually troubled but static. He is doing very little to change such as looking for a job. 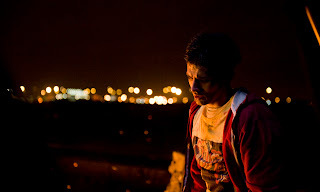 It's only when Cathal moves in that he starts to do anything about changing his life. You can tell that something happened to Fred while abroad that has caused him to be so defeated. It is only when Cathal comes into the car park that Fred's life seems to have a renewed interest in doing ANYTHING. Its because of Cathal that Fred meets Jules while hanging out at the public gym. In turn Fred tries his best to steer Cathal away from his destructive drug habits which could be more than just weed and the problems that it brings along. There is also a lot of pain behind Cathal, and his erratic behavior masks being hurt by his lack of a relationship with his father. And yet, for all their troubles, I love how happy and at peace they both seem to be in each other's company. It's almost like Cathal is the male, non-romantic version of a "Manic Pixie Dream Girl" for Fred. The way Dublin is portrayed just lends itself to a charming atmosphere. The sea side shots are breathtaking each time they appear. I did find the romantic aspect of the movie with music teacher Jules very sweet. It doesn't feel forced, and it's very much a unique "relationship", if you want to call it that. Once again, it is the work of Cathal's youthful nature that makes Fred be courageous enough to talk to her. My big problem with the movie is that it gets to be a little monotonous, constantly showing you scenes of Fred or Cathal doing mundane things or just going through the day. While it is very interesting to see the routine the first time, the movie isn't really about being poor as much as it is the friendship and self-improvement that comes from it, so why have a bunch of scenes like that? The last third of this movie is an emotional roller coaster as the relationship goes through some hardships. It's interesting to note that by the end of the movie everything in Fred and Cathal's world changes and yet the movie stays tonally consistent by focusing on their reactions to the events at hand. I understand that this sounds vague, but I am trying to keep everything spoiler free. The more and more I think about it, the more I like this movie. It had everything that you could look for in a simple drama. The scenery is beautiful as is the portrayal of friendship under most intense of circumstances. I think that Fred sums it up best when he said this about Jules' clock that he was repairing, "Good cleaning and a little nudge to spring it back to life."